If you've stopped playing trivia games because there's someone in your group who always wins, consider giving Wits & Wagers a try. Every question can be answered numerically (e.g. "In dollars, how much was each extra paid to run across the beach and scream in the movie Jaws? "), and players all answer secretly. Those answers are then sorted onto the casino-style board, and players bet on which one they think is correct. The winning bets are paid according to the odds, and play continues. Exceptionally fun and clever party/trivia game. Can be played with up to 21 players. Don't need to know the right answers to win. Some find the final "all-in" question too powerful. Some will be turned off by the gambling /casino theme. For 3 to 21 players, ages 10 and up. Published by North Star Games. Designed by Dominic Crapuchettes, Satish Pillalamarri, and Nate Heasley. About 30 minutes per game. Comes with 700 questions, 120 Poker chips, 14 cubes, timer, betting mat, laminated answer cards. 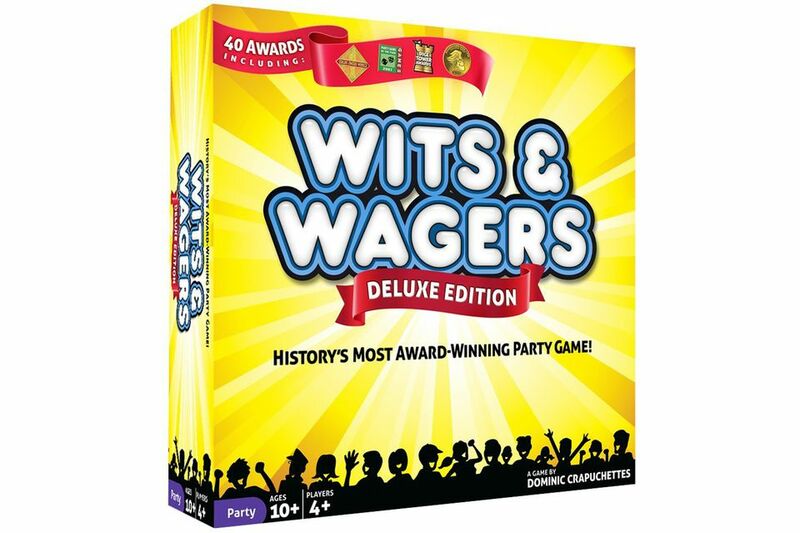 Combining the excitement of a betting game with the fun of a party game -- and using trivia to hold it all together -- Wits & Wagers is an unqualified hit among those we've played it with. Play begins with each player holding 80 points worth of chips. When a question is read, everyone writes down an answer on a dry erase board; they're all revealed simultaneously. Since all answers are numbers, they can be easily sorted and spread on the high-quality felt betting mat. Players then choose which one or two answers they want to bet on -- the goal is to bet on the one closest to being correct without going over. The answer in the middle only pays 1:1 odds, so it can be beneficial (and risky) to bet on an answer at one extreme or the other. The largest and smallest answers each pay 4:1. If you're willing to bet on "smaller than all given answers," you can win 5:1. Once the bets are made, the correct answer is read. Every player who bet correctly collects the appropriate number of chips; the player who actually wrote the right answer gets a 10-point bonus. For six questions, players are limited in how much they can bet. However, the seventh and final question allows for "all-in" betting -- and often the winner is determined by smart betting on this final question. Everything about Wits & Wagers is done right: this game provides clear rules, excellent components, and always a fun time.